I didn’t grow up in the kind of family with heirlooms. Our “good dishes” were a scalloped-edged Pfaltzgraff with a finish easily marred by butter knives. My mom’s modest collection of jewelry contained mostly the costume variety—sparkling, perhaps, but of no special value. We inherited no military relics or quilts sewn by great-great-grandmothers or brooches that crossed an ocean. But when the time comes (hopefully many decades from now) to divide my mother’s belongings, I will fight tooth and nail for one thing: her green plastic colander. She acquired the kitchen tool as a teenager, setting it aside for the day she had a house of her own. Approximately a foot in diameter and the exact shade of Crayola’s “Seafoam Green,” the colander has certainly seen better days. Its rim is warped in spots from sitting too close to the stove and the color has faded after a thousand (or more) trips through the dishwasher. Similarly scarred cutting boards and kitchen towels have wound up in yard sales. But somehow the humble strainer survived. Occasionally I’ll look around my kitchen, trying to identify the item that might become my colander. Will I use this spatula to slice brownies for my grandkids? Will one of my custard bowls survive curious toddlers and careless teenagers, becoming the little dish I use for ice cream well into my eighties? It’s hard to predict what will stand the test of time. Like this chicken recipe, for instance. Plucked from the obscurity of a library cookbook, it became a staple of my mother’s quarterly cooking days, eaten twice a month for more than a decade. (When I asked for the recipe, I got the version that yields a gallon and a nice refresher on fractions.) It’s a cinch to make and works with everything from Greek salad to stir fry. Versatile, dependable, enduring—the mark of a kitchen classic. This is one of my mom’s “Cooking Day Specials”—one of the many dishes she and a friend would make in bulk, then freeze for future meals. The resulting meat is perfectly flavored and impossibly tender. Even when I try to overcook it (my husband “likes his chicken dry”), I can’t seem to mess it up. Sorry, honey. *I am constantly out of dried mustard—a fact I usually discover in the middle of making this recipe. As a result, I’ve omitted it nearly as many times as I’ve used it. There’s a slight difference in taste, so use it if you have it. Do not, however, substitute prepared mustard (the kind in the jar or squeeze bottle). Place chicken breasts in a 1-gallon Ziploc bag. (To prevent spills in the next step, I place the bag of chicken inside a medium bowl and roll down the zippered part of the bag…similar to cuffing a pair of pants.) Set aside. In a medium bowl, whisk together remaining ingredients. Carefully pour the marinade into the Ziploc bag of chicken. Seal the bag, removing as much air as possible. Refrigerate for at least 8 hours or up to 18 hours. Alternatively, place chicken directly into the freezer and store up to 2 months. Thaw completely before cooking. Preheat oven to 375°. Coat a baking pan with non-stick cooking spray and set aside. Remove chicken from refrigerator and place breasts (but not the marinade!) in the prepared pan. Discard marinade. Bake for 15-20 minutes or until cooked through. Remove from oven and allow the chicken to rest, covered with foil, for 5-7 minutes. Serve warm or transfer to the refrigerator for future use in tabbouleh/salads/spring rolls/etc. Tabbouleh is not only packed with whole grains and fresh veggies, it’s a cinch to make. If you can boil water, you can make tabbouleh! Adapted from Barefoot Contessa: Parties (Clarkson Potter, 2001). 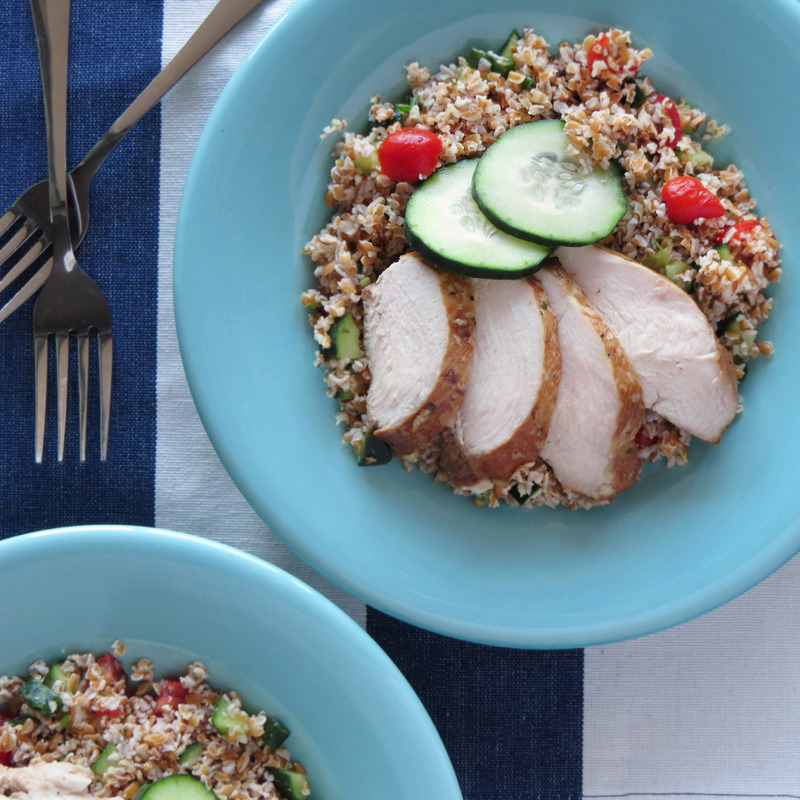 Place the bulgur in a medium-sized, heat-proof bowl. Pour in the boiling water, lemon or lime juice, olive oil, and 1 1/2 teaspoons salt. Stir well. Allow to sit at room temperature for an hour. Stir in remaining ingredients, adding additional salt and pepper to taste. Though you can serve it immediately, the flavor improves after an hour or more in the fridge. Serve as refreshing side dish or make it a meal with leftover chicken (recipe above).